On Saturday 24 November, the Rotary Club of Lochaber, supported by principal sponsors Ferguson Transport and Shipping, laid on a pre-Christmas event packed with entertainment and activity as well as showcasing Lochaber’s wide range of quality crafts and food products on display in the Nevis Centre. Blessed with a bright clear November morning, Santa and his team of Cairngorm reindeer were the highlights of the all-day festival. Supported by little elves David Rodgers, nine, from Roybridge and Aine MacPhie, six, from Mallaig, and led by the Lochaber Pipe Band and the young cheerleaders the Ben Nevis Allstars, Santa’s sleigh paraded from Cameron Square to the Nevis Centre followed by hundreds of enthusiastic youngsters and their parents. Aine and David, winners of the Lochaber Times’ Christmas Card message competition, then joined Santa in his Grotto to help hand out gifts and toys to well over 300 children over the ensuing three hours. 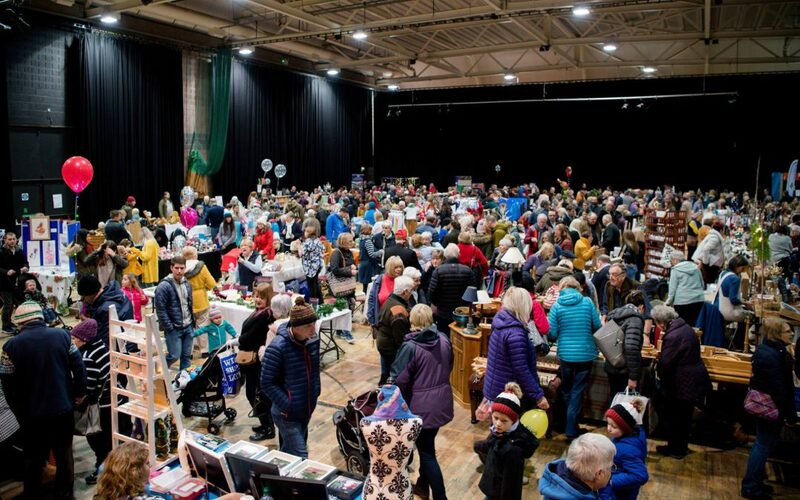 The stallholders reported steady business peaking in the early afternoon when the hall was packed with visitors enjoying the vast array of craftwork merchandise and festive products much of it unique to Lochaber. Also entertaining the crowds was non-stop music from Buskers’ Corner where seven acts, including the Great Glen Swing Band and the Lochaber Showstoppers, who performed live over the course of the day. The Bouncy Castle, Santa’s Postbox and the Light Garden tearoom were also major attractions and the “6 Classic Malts” whisky raffle, won by retired teacher Gail Young from Banavie, raised over £1,000 for local charities. Alasdair Ferguson, managing director of Ferguson Transport & Shipping, said “We were once again delighted to continue this year as main sponsor for the Rotary Club of Lochaber’s 11th Annual Christmas Festival. The event, as always, was a great success building on previous years’ successes. We were delighted to once again fund the cost of bringing the reindeer and sleigh to Fort William”. Club President Iain Johnston, while emphasising that the festival is more about a community event than about raising money, thanked Ferguson Transport for their continued sponsorship and said “I would like to thank everyone who has made this such a successful day – the stallholders, the Nevis Centre staff, the Cairngorm reindeer company, fellow Rotarians and most of all the general public. Thanks again to everyone, and we hope to see you all back next year at our twelfth festival”. As a child, Sheana used to be enthralled by the television programme “Travellers Tale” with Fyfe Robertson and unique microphone, plus fours and accent. One episode was from Peru and as a consequence, Sheana always harboured an ambition to visit there. This autumn, as part of a group organised by G Adventures of Canada, Sheana fulfilled that ambition with a three-week tour of the country which included expeditions to the Andes, the rainforest and to a desert. Commencing in Lima stops included Machu Picchu, Lake Titicaca and Paracas. Of particular interest were the Nazca Lines and a highlight was watching Condors in flight. The vote of thanks was given by Alan Kirk who had also visited Peru. Both Sheana and Alan agreed that if you ever were inclined to visit Peru you should do it now before the country gets over commercialized. Members thanked Sheana for her spellbinding talk. 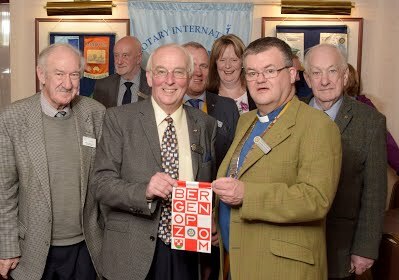 The Rotary Club of Lochaber was pleased to welcome several visitors to its lunchtime meeting on 8th November. 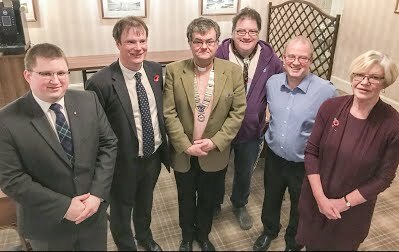 Pictured are (from left): Scott Greenlees, who was inducted into membership that day; Alastair Nicolson, son of Angus Nicolson; President Donald; Sean Sessions of 6th Lochaber (The Braes) Scout Group; Simon Hardiman, guest of Robbie Robertson; and Sheana Fraser who gave a talk at the meeting on her recent trip to Peru. 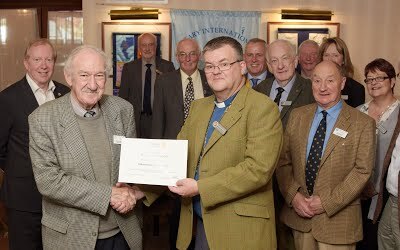 Lochaber Rotary Club stalwart and long-term Club treasurer, Cameron Sommerville, is presented with a certificate to recognise his 25 years of membership. Presenting the certificate is Club President Donald McCorkindale flanked by past-president David Robertson and members of the club. Cameron was the manager of the Fort William Branch of the Royal Bank of Scotland for many years and, in recent years, has worked closely with the local Cancer Research shop in its “Bags for Life” fundraising campaigns. Cameron is leaving the area to be closer to his family. Club members extended their appreciation of Cameron’s many years of community work and conveyed their warm wishes for the future. Thanks to Iain Ferguson for the photo’ of the presentation. At the Club’s Lunchtime meeting on 9th August, Anja Ruijlarsdaam, of the Rotary Club of Borgenopzoom, in Huijbergen Holland, joined us for lunch and presented us with her club’s banner. Pictured is Terry presenting her banner to President Donald at the meeting on 23rd August. Thanks to Iain Ferguson for the photo. 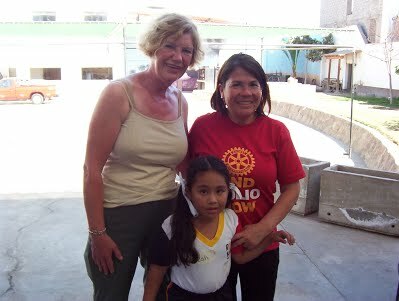 The Rotary Club of Lochaber continued its efforts to eradicate polio by holding a special lunch last week. Already this year, the club’s ‘End Polio Now’ campaign has seen them sell jars of Tiptree plum jam and distribute Purple4Polio badges. Purple4Polio is a Rotary-wide partnership with the Royal Horticultural Society (RHS), aiming to plant five million crocus corms to add a vibrant carpet of purple to communities. 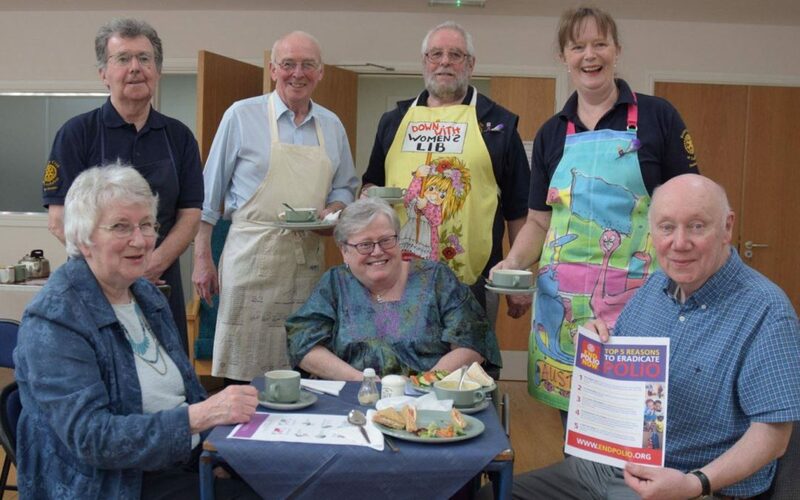 But the Lochaber branch says these events were topped on Saturday, May 13 by a soup and sandwich lunch where the generous Lochaber public, and a big turnout of visitors to Fort William, helped raise several hundred pounds to get rid of the disease. Polio is a crippling and potentially fatal infectious disease. 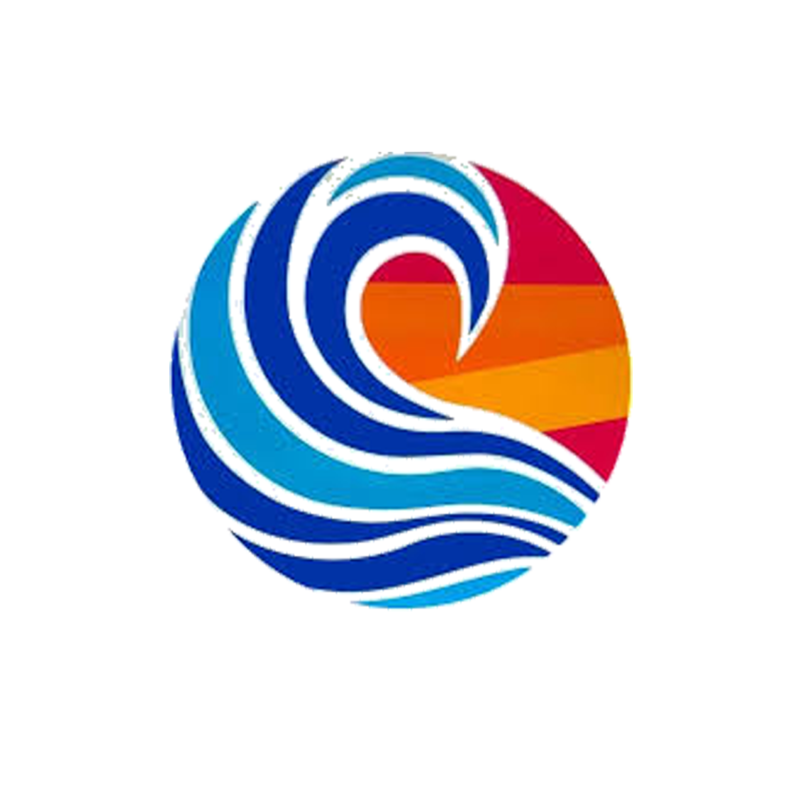 The Rotary polio campaign dates back to 1985 when Rotarians promised to the mothers of the world that polio would be eradicated and their children would no longer suffer from the disease. The Lochaber branch says this promise is on the brink of being fulfilled, with just 37 polio cases in three countries in 2016 and that there are real hopes 2017 will see the last case. Last Saturday 13 May 2017 in Duncansburgh Church Hall, the soup and sandwiches were complemented by tea, coffee and shortbread. Club members produced a range of homemade soups, including sweet potato and parsnip, tomato and lentil and cream of celery, followed by platters of freshly prepared sandwiches.